Medieval padded thigh protection is made of natural fabric and has two layers of padding. Up to 6 layers of padding are available for order - the quantity depends on the type of armour, that you plan to use over this protection. Thigh protection is being fastened with leather straps to the belt. If you want to order two-coloured medieval thigh protection, please contact us and advise the exact colours and its position. The padded chausses are perfect protection of your legs during medieval battles or trainings and can be used with any type of armour. 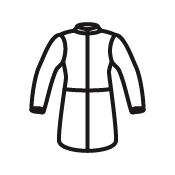 It is being fastened to the gambeson or doublet with leather straps. There are drawstrings on the calves for comfortable and tight wearimg, that is very important when using closed hinged greaves over the chausses. Chausses have one layer of padding, but you can order more than one layer. It is being made only of natural fabrics of different colours. If you want to order two-coloured medieval chausses, please contact us and mention the exact colours and its position. We recommend to use padded chausses with medieval gambeson and brigandine. Belt is not included to the price. .. This padding secures your elbows and knees, supporting and fixingthem mildly during medieval battles or trainings. It is being used together with steel elbow caps and knee caps. Standard options: - 100 % natural homespun-kind fabric - staffed with sheet wadding (natural material) .. These leather padding protect your elbows and knees, supporting and fixing them mildly. Standard options: - outer shell is made of leather - inner shell is made of 100 % natural homespun-kind cotton fabric - staffed with sheet wadding It goes good together with steel elbow caps and knee caps. ..